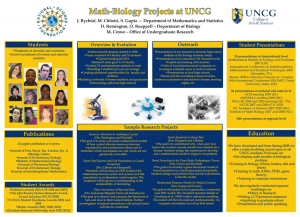 We are looking for 8 or more students participate in the math biology REU projects at UNCG during Summer 2017. The students work on the research between May 22, 2017 to July 22, 2017 and receive a stipend of $5000. 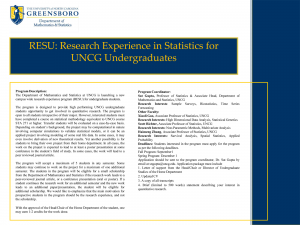 The Research Experience in Statistics for UNCG Undergraduates (RESU) Program is designed to provide high performing students the opportunity to get involved in quantitative research. The program is open to all students irrespective of their major. However, interested students must have completed a course on statistical methodology equivalent to UNCG course STA 271 or higher. 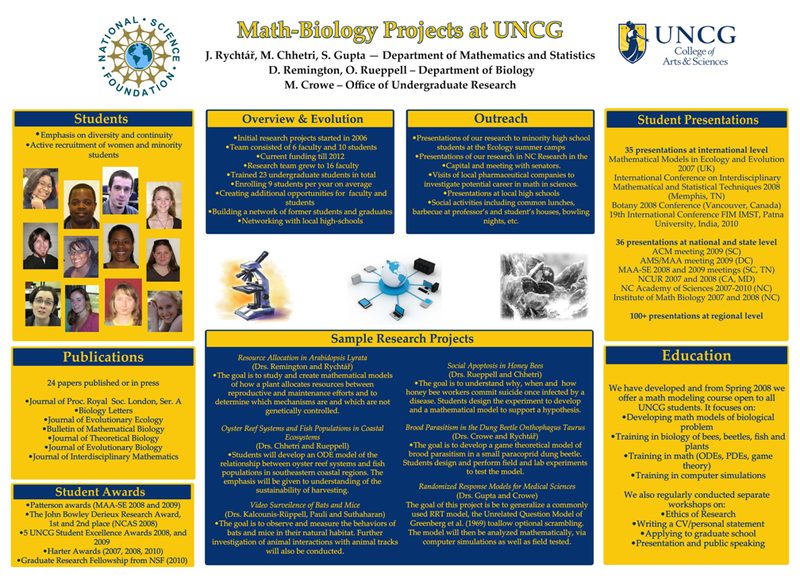 The UNCG Undergraduate Research and Creativity Award (URCA) is designed to help faculty and students partner in meaningful projects that result in advances in understanding within their discipline. Support can be used to help defray the cost of material expenses and/or related travel, or can be used to provide a stipend for the students. The general URCA program is funded through the indirect costs generated by external grants awarded to UNCG. Many faculty in the department have been successful in securing these awards. 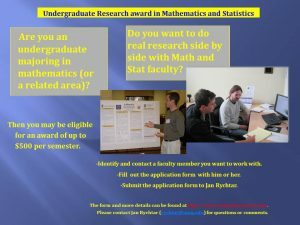 The Department of Mathematics & Statistics currently provides this opportunity using H. Barton Excellence Professorship Funds. To date, four students have received this award. The major push for undergraduate research in the Department started in 2005 with the establishment of a math-biology research group by Rychtář, Chhetri, and Gupta from the Department of Mathematics and Statistics, Rueppell and Remington from the Department of Biology, and Crowe from the Office of Undergraduate Research. The group has been funded by two major NSF grants; 0634182 (2006-2010) and 0926288 (2009-2013). Over the years, this research has involved 16 faculty and over 45 undergraduate students. The students and faculty received 33 awards and recognitions, gave over 250 presentations, and published over 40 research articles in major international journals. National Science Foundation funded Research Experiences for Undergraduates Program (REU site for 2014-2016): This NSF-REU is an opportunity for students to engage in research in the summer. During the 10 weeks students get the opportunity to actively participate in all activities, including regular group research meetings to discuss related articles, brainstorm, discuss problems; propose solutions and work toward moving the research forward; write a paper about their research; present (both in written and oral form) to the group about their research project, and present their research at regional/national meeting(s). This program is funded by MAA (2013-2015) and is a joint effort with Bennett College. 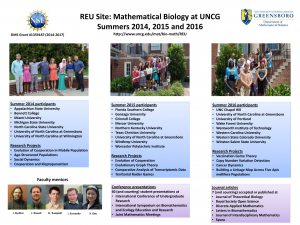 This NREUP supports the participation of mathematics undergraduates from underrepresented groups in focused and challenging research experiences to increase their interest in advanced degrees and careers in mathematics. The department will continue to nurture undergraduate research with the Center for Undergraduate Research in Mathematics (CURM) and Preparation for Industrial Careers in Mathematical Sciences (PIC) grants for 2015-2016.